Bright colors, bold flavors and crunchy-creamy-chewy textures make this fresh salad a delightful counterpoint to rich holiday entrees. Whisk the lemon juice, mustard, tamari, shallot and garlic in a bowl. Slowly add the olive oil in a thin stream, whisking constantly to emulsify the mixture. Place the greens in a large bowl. Add the cranberries, carrot and almonds and toss lightly to distribute, then drizzle the vinaigrette over all to taste and toss again. 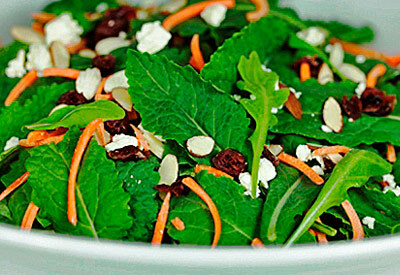 Divide among 6 serving plates and sprinkle feta cheese over the top of each salad. Serve immediately.